Efficient construction rates of concrete structures by means of slip-forming methods. 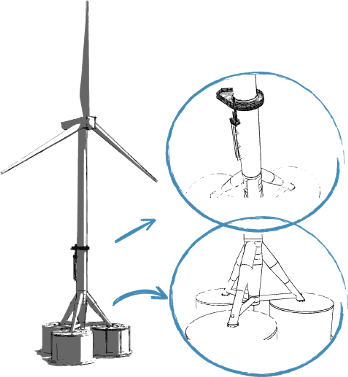 GBS geometry must be easily scaled to fit within depth range in the wind farm. It should be a self-buoyant solution to avoid the use of heavy lift vessels. Reducing weight over water line, lowering gravity centre and increasing naval stability. Decommissioning or re-floating if necessary. Minimization of the use of port area for construction and storage. Transport of the wind turbine assembled on the GBS. No noise or pile driving. Environmentally friendly. Low loads transmitted to the terrain. Adapted to large range of soil conditions.